It has been a long time coming but I've made my 50th sale! Thanks to ShimmyShimmy for purchasing one of my vintage scarves. This is also my first sale to Texas. Part of what is exciting to me when a sale has been made is to see where in the world my items are traveling. I have lots more vintage scarves to list so come by my shop in the near future to check them out! One of my baubles made it into a beautiful treasury. I'm always flattered when someone choses one of my pieces to be included into their gallery of work. Thanks to Nancy at Local Colorist for this special treat. 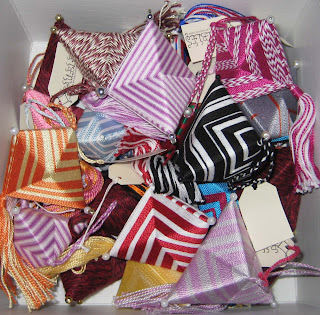 Please check out her shop of beautiful origami peace cranes and ornaments. You can check out the treasury for real (while it lasts) by clicking the title of this post. I've recently added a bunch of new baubles to Lucky Zelda. Perfect for that unique hostess gift (how many candles does a girl need, really) or company gift exchange, my intricately woven baubles are your ticket to everyone wishing you drew their name. Go to my Esty shop to see the latest bauble listings. Comment back & let me know what you think!